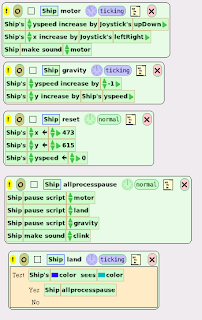 It's great fun manipulating the joystick to control the speed of descent. Mesh Networking: Each XO has mesh networking capabilities that allow it to broadcast and connect to any laptop around it, allowing activities to easily be made collaborative. Camera: Each XO has a videoconferencing-quality camera embedded to the side of its display. Tablet Mode: The XO laptop has a distinct tablet mode where the screen can output high-resolution b/w graphics in sunlight conditions and features built in game-pad like buttons. This mode might lend itself to specific styles of play including one involving real-world activity beyond a confined space. 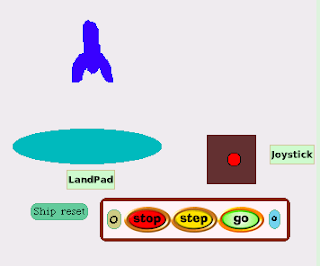 Malleable Games for Learning: A key consideration of the OLPC effort is certainly learning. However, more importantly it is hoped that kids can use the laptops to create their own games and experiment deeply with learning games by having access to modify and change them as part of a learning process. This track will elicit games that speak to this ideal. "There aren't too many games right now that take advantage of mesh style networking," said Klein, referring to the XO's ability to use Wi-Fi to communicate with other users up to a kilometer away, and display them as icons on its Sugar interface. "There are networked games, sure, but they aren't sensitive to the ability to display the presence of other users depending on where they are in relation to you, or to pop up on the screen when they are close enough." Documentary-maker Tim Samuels travelled all over Britain recruiting isolated and lonely old people. The finale of the show is this group of lonely old people coming together to form a rock troupe and trying to get into the pop charts. CBS 60 Minutes has run a detailed interview with Nicholas Negroponte (including his critics / competitors such as Wayan Vota / Intel) about the One Laptop Per Child Project. Worth watching the online video. Negroponte started on this pathway by founding a school in Cambodia in 1999, putting in a satellite dish and generators. Then they gave the children laptops. Instantly, school became a lot more popular. "The first English word of every child in that village was 'Google'," he says. "The village has no electricity, no telephone, no television. And the children take laptops home that are connected broadband to the Internet." When they take the laptops home, the kids often teach the whole family how to use it. Negroponte says the families loved the computers because, in a village with no electricity, it was the brightest light source in the house. Another relevant fact from the interview - Fifty per cent of the children in Pakistan and Nigeria are not in school. OLPC can provide some sort of education for these children. I've put forward two presentations and one workshop for the Computers in Education, South Australia Conference (CEGSA), 19-20 July, 2007. Not yet approved. Description: Alan Kay, winner of the 2004 Turing award, invented the GUI and the first object orientated programming language, Smalltalk. His educational vision, developed over 30 years, has not received as much attention but is just as interesting. This presentation will describe that vision. Description: The One Laptop Per Child project plans to release millions of cheap laptops to developing countries over the next few years. This presentation will discuss the hardware, software and educational goals of the OLPC Project. Description: Etoys / Squeak is a powerful drag and drop programming language which has been included on the one laptop per child project. This session will demonstrate how to program in Etoys. John Maxwell has read all of Alan Kay's writings and claims to have summed up his educational vision in six main points. Here are some rough notes. Best to read his dissertation of course. Alan Kay was strongly influenced by Seymour Papert. I've written extensively about Papert elsewhere (Papert, ISDP, Behaviourism, Invitation) and won't go over that ground again here. Alan Kay set out to design a personal meta medium for children. This goal led to a shift in his thinking about user interface. Rather than access to functionality, a child-centred user interface would be an environment in which the users learn by doing. Smalltalk is better described as a communication medium rather than a programming language. The Smalltalk environment is more important than the language. It has a recursive design. Why divide a computer into weaker things such as data structures and procedures? Instead why not divide it up into little computers? There is not a clear dividing line between "objects" and "actors". Both are different aspects of the notion of process. The ethic of mutability: Every component of the system is open to be explored, investigated, modified, built upon. The distinction between tool and medium is blurred. User interface design should integrate these modes. With Etoys the user does things with images (play) and gradually the symbolic meaning emerges. 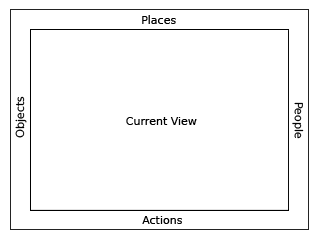 A significant thing about stories is whether they are good, not whether they are completely consistent internally or externally, they may contradict other stories. Only a tiny fraction of people are fluent in these forms of communication. Children are wired for story telling but not for logic and systems theory. The computer as a medium is capable of simulating any descriptive model. Simulation is more effective learning than a maths equation and made possible through the computer. So far, this has worked for science, but not for school. Martin Luther considered teaching Latin to Germans. But then he opted to restructure German so that it could handle philosophical and religious discourse. For many, today, print has failed as a carrier of important ideas. Postman in Amusing Ourselves to Death has argued that as a society we are incapable of dealing with complexity. Literacy is powerful ideas. The "haves" are those who can discern these powerful ideas. How can children have an embedded cultural experience that encourages learning logic and systems theory? The Montessori approach is free choice and self development of preferred objects to think with. Bland phrase, the meaning of which is highly contested. "Educational computing" currently makes no sense. There is no guiding rationale or set of common principles that we can agree with or critique. It is all mush. Conventionally, the computing world consists of experts and end users, producers and consumers. These are roles that many teachers accept far to readily. Some radicals have seen the computer as a transformative agent and have attempted to challenge these conventional roles. 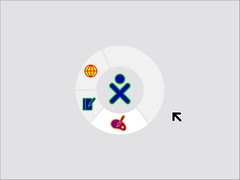 For example, Papert saw logo as a means to put advanced ideas into the hands of unsophisticated users. This message had some influence for a few years but slowly sank almost without trace. Alan Kay's Dynabook idea was also a radical break from the conventional division of labour but one that had less penetration than Papert's. Uncritical acceptance of and buy into industry originated solutions and campaigns which disempower everyone - students, teachers, schools. Office productivity software, the proprietary way. Miracle worker discourse. This brilliant teacher, rare individual, can work miracles with the computer. Meaning that most teachers can't. Learning objects or distance education curricula. Knowledge and authority is vested with the publisher or the information source. Critical educational thinking is not applied to the basic question, "What is the computer for?" It's either there to achieve a particular goal which existed in the curriculum before the computer existed. Or, technology has an innate progressive, or sinister, logic of its own. We lack any clear sense of what computers might be good for. Maxwell's dissertation presents a historical solution to this problem by tracing the Dynabook and it's main author's (Alan Kay) thinking over a 40 year period. He gives us a history of powerful ideas, rather than "where do you want to go today"
Pierre-André Dreyfuss wrote to me while holidaying in Australia and with the help of lucychili we organised a meeting with him last Wednesday in Adelaide. Pierre-André has an intensive background in logo, microworlds, toontalk, etoys / squeak and loves to talk about programs he has done in them. He is a very committed and dedicated educator. It was fairly amazing meeting someone from another country whose programming software passions were pretty much parallel to my own. Here is a v-toys page in French, translated into English using google translate. Update: I have updated the translation in English URL, as Tony pointed out the earlier one was temporary. You have to quickly grab the URL while google translate is translating. Thanks Paul. So it's not logical that the human computer user interface (UI) will always be based on a desktop metaphor of windows, icons, menus and pointers (WIMP). Something better will come along. Everyone will be able to keep a complete video recording of their whole life. "Sixty kilograms (of diamond) can store a lifelog for the entire human species for a century." The study of history will no longer be gappy. Total history. Privacy will be an alien concept. You can see the beginning of this in the way that young people, in particular, reveal all sorts of details about their lives on line. I think the inevitable loss of privacy there will fuel a political movement for a fundamentally different sort of non intrusive government or state apparatus. It's more sensible to fight for this than to throw away your mobile and go and live in a forest or a desert. That would be analogous to fighting for the right enjoyed by our ancestors, never to travel more than a few miles from their village. OLPC may sell in the USA to achieve the economies of scale needed to bring the price down to $100 by 2008. The current price of the OLPC is $176. This threatens to undermines the economies of scale required to bring down the price of the OLPC to $100. "We need to trigger a supply chain for three million units to get started," Negroponte says, "and need a few large agreements to kick it off. I just cannot do 300 deals of 10,000 each." It seems to me, therefore, unlikely that the OLPC will be offered for sale in Australia shortly because of our low population. However, I believe that special submission could be made to sell the laptop to aboriginal communities, who have long lived in third world conditions. However, a few days later, due to sore ribs when I lay down to sleep I checked myself back into hospital, last Sunday morning. The doctors are now saying that I have a couple of small blood clots in my lungs (pulmonary embolism) and a mass on my left kidney which looks like a cancer. With luck I should be able to resume a normal life after that. I’m feeling strong. I've been AWOL since last Thursday, in hospital. I checked in for a routine test (prostrate biopsy) and something went dramatically wrong. I became the one in a thousand statistic that is mentioned when these tests are suggested and which you think will never happen to you. I was bleeding uncontrollably for many hours and needed a blood transfusion and a couple of operations to fix it. Many thanks to Queen Elizabeth Hospital staff for their expertise and help. And to friends who visited and left phone messages. I'm continually amazed by our progress in medical knowledge. I feel I'm on the road to a full recovery. I was thinking of creating a separate blog to discuss some men's health issues in more detail. Will keep this entry short though.